We want to see what you’re wearing and how you’re rocking it. So, after months and months of R&D we’ve come up with this extremely intelligent and complex hash tag for Instagram. Well, maybe not that intelligent and complex, but we like it. Style is something we really enjoy, and something that is often underrated even in todays stylish world. It’s not just about what you’re wearing though – a huge part of looking good is how you wear it. 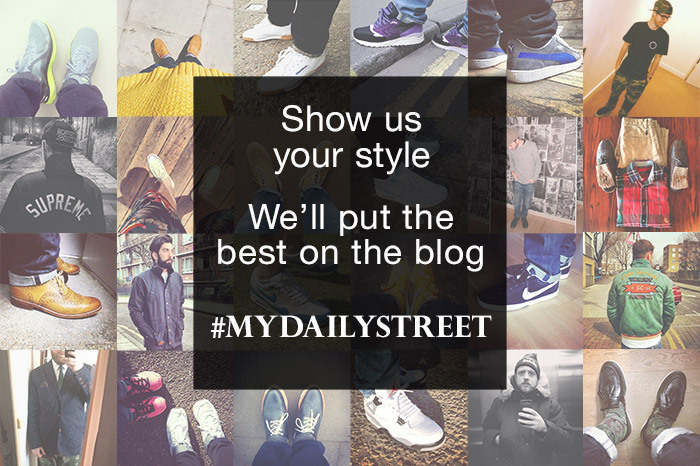 With this in mind, we have launched #MYDAILYSTREET, an area of Instagram where you can upload your stylish shots and see other likeminded people’s. Each week we’ll select the very best (and only the very best) shots uploaded to the hash tag and showcase them in a weekly round up on here. Credited and linked to your profile of course. So you want that bit of Instafame? Get uploading and tagging – but remember, it’s all about the quality of the photo and the style within it. Head on over to Instagram and get involved!